Sorry the posts have been a little less frequent for the past week or two. I have been traveling like crazy. As my husband and I checked into a hotel on Saturday, I remarked that it was the 6th bed I had slept in for the week. Yes, the sixth. Four different hotels, one night in my own bed, and a short stay at my sister’s house. Needless to say, there has been lots of work, lots of fun, and just a lot going on! I have just returned home after a weekend on San Juan Island in Washington State. We had some amazing weather and even got to see a group of Orca Whales. Very exciting. 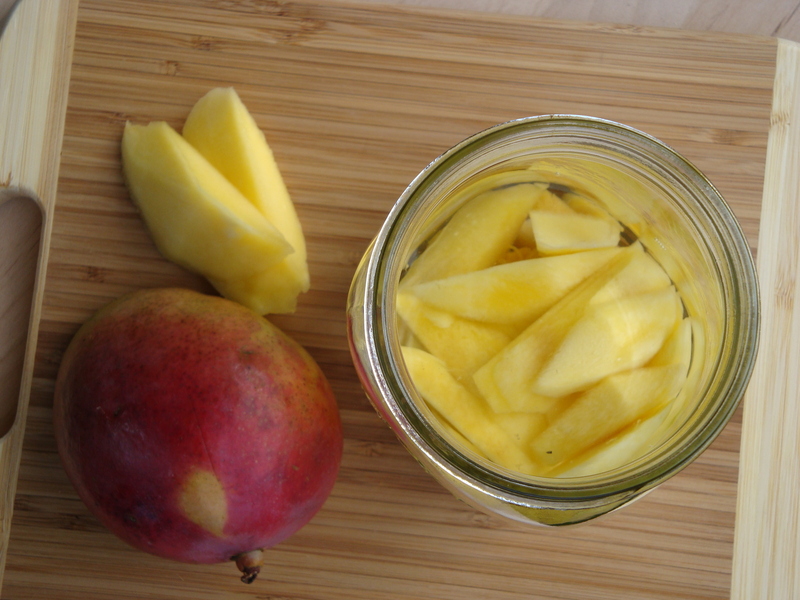 Infuse the mango in vodka for approximately 3-4 weeks. Strain and filter, then add the simple syrup. Age for another 2-3 weeks for the flavors to mellow. When we first filtered this, the mango flavor was a bit bitter. But as with many fruit liqueurs, the flavors mellow with some time and rest. This is finally ready to drink. I’m happy to report that I’m enjoying a delicious cocktail with this liqueur as I write this. Categories: Infusion, Liqueur, Recipes | Tags: Liqueur, mango, recipe, vodka | Permalink. Yum! Do those jars come with locking lids? Not sure I have the patience to wait an additional 2-3 weeks for flavors to mellow. It usually works best to hide the jars and try to forget about them for a while. If all else fails, I think it is very important to taste them often to see when the flavor is perfected! Hello Alicia, this is my first attempt at Mango Liqueur. We have the best crop of Mango’s for over 5 years and have made Mango Chilli Chutney, preserved mango, dried mango and frozen mango and now Mango Liqueur! Pardon my ignorance but what is ‘TB thick syrup’? I gather 2 c of Vodka is 2 cups? 250ml cups? Can I use a screw top jar to store the infusions? Hi Suzanne! Wow, I can’t even imagine how heavenly it must be to have your own crop of mangoes! So to answer your question, TB is the measurement for tablespoon. One tablespoon has about 15 cc or mL of volume. The thick syrup is simple syrup made from sugar and water. To make a thick syrup, I usually take about 1/2 cup (about 100 grams) of white sugar and 1/3 cup (80 mL) water and combine in a saucepan on the stove. Bring to a boil and let it simmer for a few minutes. Remove from the heat and allow to cool completely before adding to your infusion. That looks delicious. I tried to make mango liqueur once when the fruit at the grocery store was spectacular, but it turned out way too sweet. I’ll have to try again with these ratios. Can you mash the fruit to get a fuller infusion? Or does it not filter well? you could try mashing the fruit, although I don’t know that it would improve the flavor. You may want to try a longer infusion time if you are looking for a “fuller” flavor, or use a little more fruit. I infuse raspberries for about 3 months. A lot of liqueur recipes call for a ridiculous amount of sugar. The nice thing about using simple syrup is you can add a little at a time until it gets to your preference. I would rather make it less sweet and add more sugar later if it needed it. Last summer I made a peach liqueur that turned out to be a little bitter and ascerbic. I brown-bagged the peaches to get them over-ripe and attempted the extraction again and got a sweeter, mellower, and more aromatic result. Could be that some of the naturally-occuring enzymes in the fruit began to break down those sugars and made for a better liqueur. It was so good that it didn’t even need sugar! Looks great, and it’s nearly mango season over here! Sounds very refreshing. I’m going to have to give it a try. When you say thick simple syrup, do you mean about 2:1 sugar to water? I usually do about 1/3 c sugar to 1/4 c water. So it is not quite 2 to 1. I put the recipe and process I use in the Coconut Liqueur posting that was back on March 4th. Whatever ratio you use, just add the sweetener a little at a time until it is to your preferred taste. I love mangos and anything alcoholic so I’ll definitely be giving it a try. Hi there! Wanting to try making some liqueurs this year. I have made mango jam for years, but looking to try some of the liqueur of it. 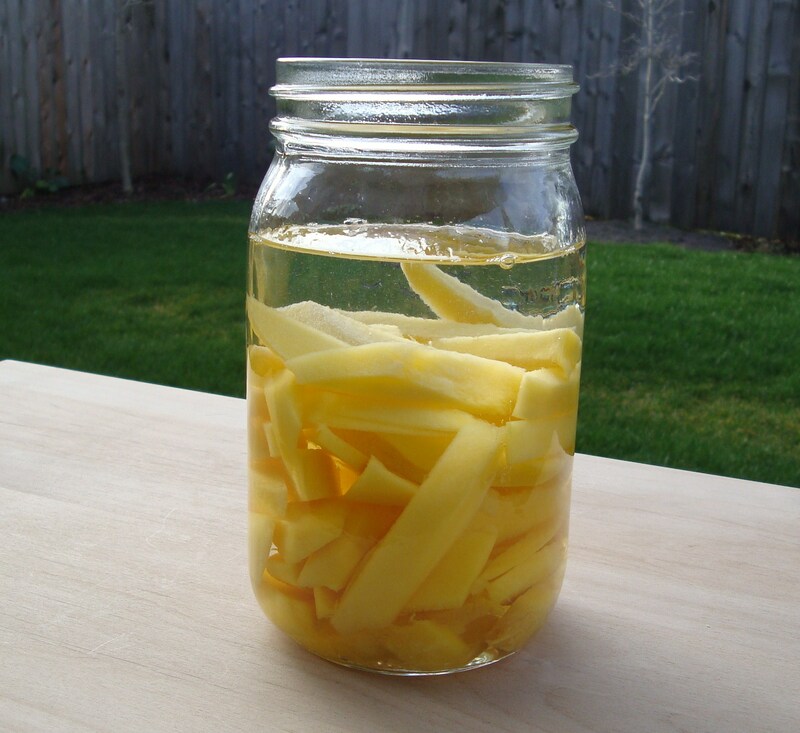 What I notice is that your mango spears in your jars look really light in color..such as they might be if not fully ripe. The fully ripe fruit has far more flavor and aroma. Does it make a difference technically? I tried this infusion once, but I think the recipe said use the peels or something, and it was a disaster. Will try this one when I get better fruit. Thanks so much for your blog. Also glad you enjoyed your visit to my old home of 20 years..and the orcas..I love them dearly, and have had many personal experiences around them.. I have no website..just like to try things and recipes. Sorry for the long delay in response… a riper mango would have indeed created a tastier flavor. Mango jam sounds great!